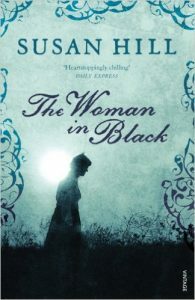 If you enjoy ghost stories, you would probably enjoy reading The Woman in Black. Especially if you like stories that involve spooky, old houses. The first chapter starts off a little slow, but it also arouses the reader’s curiosity: what has happened to Arthur Kipps and what is this story he is going to try and lay to rest, as he lays it out on paper throughout the rest of the book? I’d already seen the TV version, and knew the answers. That didn’t stop me enjoying the book though. The Woman in Black is written in the first person. I read the paperback version, it was 160 pages long, and I noticed a few very slight differences between it and the 1989 TV movie that is based on it. There are considerably more differences between book and Hammer’s movie, starring Daniel Radcliffe (2012), which fails to do the book justice. When the former resident of Eel Marsh House—Alice Drablow—dies, there is no one to mourn her. She has no friends and no family and spent the last years of her life living as a recluse. The firm of solicitors who employ Arthur request that he travel down to the village of Crythin Gifford and represent them at their former client, Mrs Drablow’s, funeral. After that he is to visit the deceased’s home, sort through her papers, and forward any of importance. Eel March House is an unusual place. It is situated on an island that can only be accessed via a narrow and dangerous path called Nine Lives Causeway. To complicate matters further, the causeway is only accessible for a few hours each day, when the tide is out. Add to this the fact that there are marshes on either side of the causeway, and the whole area is prone to sudden fogs (called frets) that swirl in from the sea without warning, and you can well imagine the difficulties Arthur might have if he suddenly needed to leave the island. From his very first contact with the people of Crythin Gifford, Arthur realizes that there is some sort of superstition surrounding Eel Marsh House and its former owner. Arthur encounters the woman in black for the first time at Alice Drablow’s Funeral. She stands at the back of the church—a solitary mourner dressed in an old-fashioned black dress and bonnet. Her skin is very white and stretched tightly over her bones. The woman looks so unwellArthur thinks that she must be suffering from a wasting disease. The Second time Arthur sees the woman in black is within the grounds of Eel Marsh House. She is standing in the ruins of a family graveyard, and for the first time Arthur senses a malevolence emanating from her. Arthur wrestles with his fear and goes to confront her, but she disappears. Who is the woman in black; what was the accident on the causeway, that can be heard re-enacting in the fog; and what is making the noises in the locked room at the end of one of the corridors? These are all things that Arthur wants to find out, but when he does learn the truth of what has only previously been hinted, will he be strong enough to take the consequences?